We all know that teachers LOVE clipart… right? I know that I sure do! Do you need new borders to liven up your educational resources? Grab these FREE Bitty Borders. They are little bitty borders that will leave your resources with plenty of room for the “good stuff”. 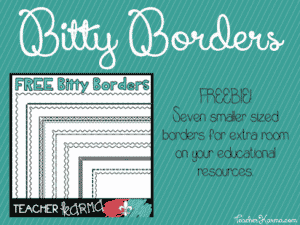 Bitty Borders: Fit It ALL On One Sheet!